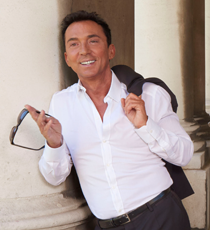 Bruno is most recognised for his role as a judge on BBC’s hit show Strictly Come Dancing, with his effervescent personality securing him as a household favourite. Bruno has become an authority on the world of dance, and judges alongside Len Goodman on the US hit series Dancing with the Stars – the successful US version of Strictly Come Dancing which premiered this season with 24 million viewers. He has also appeared in guest-judge roles on Australia’s Dancing With the Stars. He has made many guest appearances on entertainment news shows in both the UK and USA including Tonight with Jonathan Ross, The Jay Leno Show, Larry King Live and Oprah to name but a few. Bruno started his professional career as a dancer and came to London as a leading member of the Paris based company La Grande Eugene; he then joined the Lyndsay Kemp Company. Bruno worked very successfully as a freelance dancer before starting his career as choreographer working with Pamela Stephenson and Not The Nine O’Clock News. He then went on to work extensively in the music business, choreographing videos stage shows and tours for many artists including the likes of Tina Turner, The Rolling Stones and Elton John; and has also choreographed an endless number of feature films and commercials. Bruno landed the exciting role of judge on Strictly Come Dancing in 2004 which propelled him into the spotlight. He has also gone on to co-create the BBC show Dance X in the UK and Dance Wars in the US. 2012 was a busy year for Bruno (a passionate cook), as he launched his own range of Italian inspired cookware on QVC and retold his amazing life story for his autobiography, My Story, which was published by Headline in September 2012. Bruno is fluent in English, Spanish, French and of course Italian.